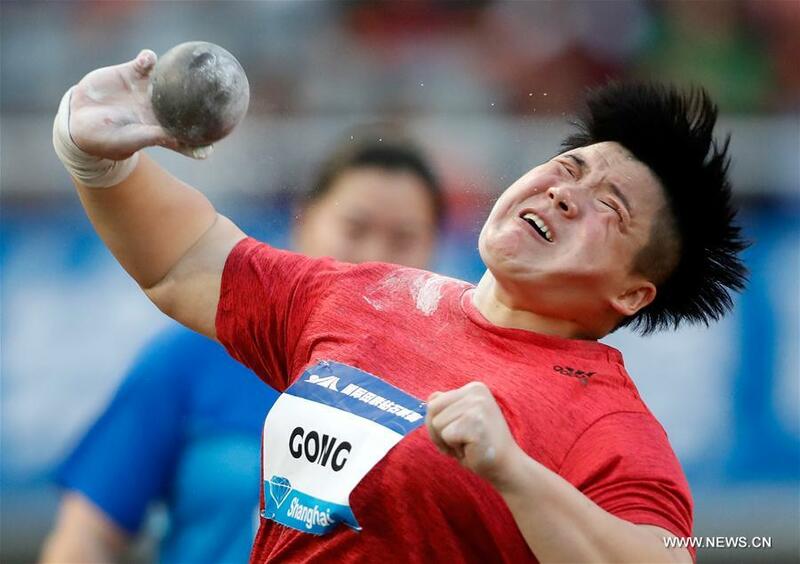 China's Gong Lijiao displayed her consistency into the 2018 season with her victory in the women's shot put at the IAAF Diamond League Monaco meeting on Thursday, while the men's shot put title went to Olympic champion Ryan Crouser of the United States. Defending world champion Gong won the title last Sunday at the Athletics World Cup in London, and established a world-leading 20.38m in June. Gong positioned herself atop standings with 19.44m in the first attempt, and improved that to over 20m in the third round, the first one to have achieved the feat among all participants. She never faced huge challenge from her opponents throughout the match, and witnessed a final best of 20.31m, winning her second straight Diamond League title after the Shanghai meeting. Gong ranked second at Diamond League standings with 16 points, two shy of American Raven Saunders who finished second with 19.67m in Monaco. German Christina Schwanitz, world champion in 2015, was placed third at 19.51m. Valerie Adams of New Zealand, double Olympic champion and four-time world champion, has signaled a comeback into the event after giving birth last October, sitting fourth with a season-best 19.31m. In men's part, Crouser shrugged off injury in last month's US Championships to win the title with a fourth round of 22.05m. Fellow American Darrell Hill and Brazil's Darlan Romani finished second and third respectively. Other events of the Monaco meeting will be held on Friday.